Four years ago, Arlington officials spent $4.1 million to build a 10-mile fiber optic network aimed at allowing local businesses to get cheaper access to higher-speed internet — since then, the fiber has just sat in the ground, almost totally unused. 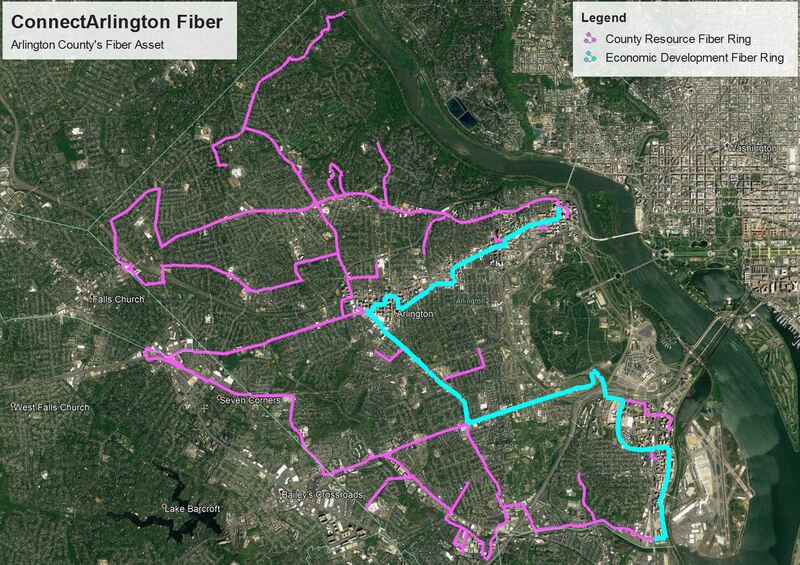 At the time, county leaders championed the construction of the “dark fiber” network as a transformative step for Arlington. Though the county is barred by state law from offering internet service itself, officials envisioned smaller internet service providers working with local tech firms to “light” the fiber, providing county businesses with a powerful new option to access the internet at blazing-fast speeds. 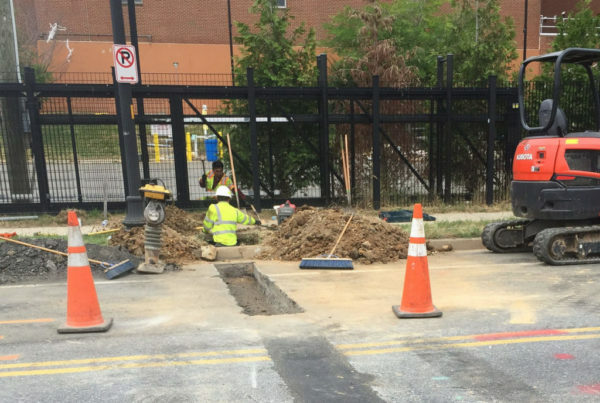 But an ARLnow investigation shows that Arlington officials made a series of decisions in designing the program that scared off any businesses interested in leasing the fiber. A committee of broadband experts convened by the county laid out many of these problems with the network, dubbed “ConnectArlington,” in a thorough report recommending an extensive overhaul of the program’s design. At least one member compared ConnectArlington to the infamous — but never built — “bridge to nowhere” in Alaska. County officials, including County Manager Mark Schwartz, have now been aware of the group’s conclusions for close to eight months and they say they’re already hard at work to heed some of the committee’s recommendations. The report has even since been forwarded along to the County Board, even though Schwartz had originally hoped to wait to deliver his own recommendations for the program alongside the committee’s conclusions. Now, it remains an open question how the county will work to address the problems with ConnectArlington, which costs hundreds of thousands of dollars per year for the county to maintain. The Board decided to build the 10-mile network in February 2015, reasoning that it would be a logical extension of the county’s existing fiber network, which connects county facilities, schools, radio towers and traffic signals. Then-County Board member Jay Fisette touted it to ARLnow at the time as a “competitive advantage over other jurisdictions,” positioning it as a key tool for economic development in the county. It was also designed as a way to provide more competition for large ISPs like Verizon and Comcast — the county’s own research shows that companies at roughly 60 percent of all county office buildings only have one ISP able to offer them fiber-based service. But the network’s design and the county’s conditions for leasing out the fiber were flawed from the very beginning, according to the broadband committee’s report and interviews with four of the group’s six members. A chief concern is how the county chose to build out the fiber. Officials designed it as “middle mile” service, meaning it runs along major roadways (along the Rosslyn-Ballston corridor and Columbia Pike, for example) but didn’t initially connect to the buildings along the corridors. “To be useful, the network must be complete,” the report argues, according to a copy obtained by ARLnow. The report has not been publicly released by the county. Rozycki also works as the CEO of Potomac Fiber, a local internet service provider, and he says the lack of connections to large office buildings, known as “laterals,” would be particularly challenging for a company like his. The document is full of legal jargon and complex provisions — a copy of the agreement provided to ARLnow clocks in at 72 pages long — which worried some prospective customers. Committee member Deb Socia says she’s seen all manner of communities leasing out dark fiber have success with considerably shorter, less complex agreements. She heads a group called Next Century Cities, which works with dozens of localities around the country to champion access to high-speed broadband, Arlington included. “We have seen that a simple and straightforward lease agreement can help to ensure that the asset brings the most value to the community,” Socia said. The agreement also allows the county to boot ISPs off the network with just one year’s worth of notice, complicating any efforts by an ISP to sign customers to long-term deals. Rozycki said the terms of the agreement pushes so much risk on to his company that his investors threatened a revolt when he tried to sign a deal with Arlington. That sort of risk-averse position by county officials meant that even businesses that found an ISP willing to hook them up to the dark fiber faced issues. Chris Wargo, the co-founder of security consulting firm Infolock, says he spent close to a year working to get access to ConnectArlington. 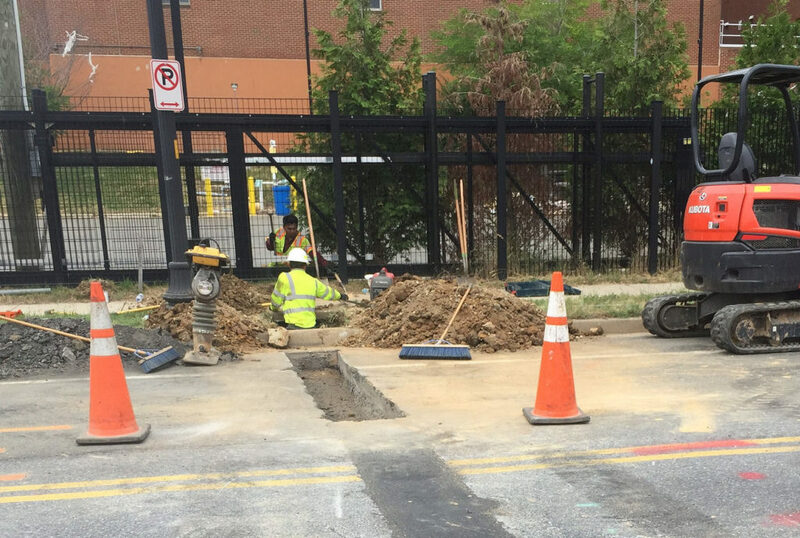 After confirming that a lateral was already installed to link the network to his company’s office building at the Village at Shirlington, he approached the county about the prospect and quickly found a local ISP to light the fiber. From the preliminary numbers he saw, Wargo says he could’ve managed a “major cost savings” getting fiber access through the county. But after months of back-and-forth, Wargo got word from county lawyers that it’d be impossible for him to lease the fiber, and he was forced to work with a large ISP instead. County leaders say that the decision to turn down Wargo was anything but simple, much like the rest of the problems identified by the report. Officials argue that everything from restrictive state laws to the county’s obligation to protect tax dollars have hamstrung their efforts to make ConnectArlington a success. In Wargo’s case, Belcher says Infolock’s building was only connected to the dark fiber in the first place because it’s also home to a radio tower powering 911 service in the county. Once lawyers took a look at the situation, Belcher says they determined the ISP couldn’t use the same equipment designated for such an important purpose. “It came down to a prohibition that said it’s set aside for the public safety radio network and couldn’t be used for other purposes,” Belcher said. County attorneys saw additional legal problems with building laterals on private property, as such a move could similarly be a “great liability” for the county, Belcher said. Rozycki said he “broke out laughing” when he heard that same sort of argument from county lawyers, considering how safe this sort of equipment is to use. Even Belcher admits he’s a bit skeptical of such thinking. Still, she believes that the county’s problems demonstrate a clear need for a “different mindset” when it comes to managing the program. On that front, Belcher agrees, particularly when it comes to rethinking a license agreement that he concedes is a bit outdated. For its part, the committee urged the county in its report to remove the “poison pills” and “contract traps” in the agreement that scared away companies like Rozycki’s. The group also urged the county to rewrite the agreement “in plain English,” offer longer lease terms and provide “adequate remedies other than contract termination” should problems arise with the network. And Belcher and Corr both say the county’s technical workers and lawyers are already huddling up on the best way to revise the license agreement to make it more palatable to ISPs. “There’s been a lot of movement based on the report,” Belcher said. But there are other steps the committee recommends as well. The group hopes to see the county build new laterals, offer grants to companies hoping to do the same and advertise incentives to ISPs looking to enter the market. Brent Skorup, a member of the committee and a senior research fellow at George Mason University’s Mercatus Center, even wrote a special section of the report recommending that the county let companies use the network as a chance to experiment with autonomous vehicle technology. He points out that cities like Atlanta and Austin have had success with similar programs, and he reasons that the network’s proximity to major roadways would be a boon, rather than a hindrance, for such a purpose. “They could be promoting innovation and allowing a permissive environment for companies to use this network if they can,” Skorup said. Yet all those aforementioned changes would require the County Board’s sign off, and there’s no telling when officials will debate the issue. Belcher says the committee presented the bulk of its findings to Schwartz and other staffers last June, before delivering a fully finalized version of the report in mid-January. Rozycki, who drafted most of the document, says the draft Schwartz and others saw this summer was virtually the same as the final one — Belcher chalks up the delay in issuing the finished product to a series of vacations and some staff turnover, not major changes in the report. That leaves the matter with Schwartz, who has now had months to decide what to recommend to the Board. Despite ConnectArlington’s problems, Belcher hopes the county’s leadership will decide to recommit to the program. While officials had once entertained selling the network to someone else, he thinks it has huge potential to enable new partnerships with everyone from local hospitals to Amazon. For all their criticism, committee members agree. Socia says she applauds the county’s “willingness to look for ways to more fully utilize” the network, instead of simply giving up. Rozycki is even cautiously optimistic that the county can someday make use of its hefty investment in the project, so long as it can successfully lure in a few ISPs. But he expects that managing that feat will require a truly thoughtful response to the program’s problems.